Designed for small batches and frequent changeover, the R760 is a machine designed to grow with your product. If you require higher speed than your table top blister machine can achieve, the R760 development blister machine can be used in the same way as the R550 table top machine, or with the addition of modules can be upgraded to fully automatic production. With the R760 blister machine you eliminate the time you would normally spend on changing basic tools because you can plug in different tools into each modules. Tool changeover is via plug in docking stations, which means the machine can be easily and quickly be set-up and operated by trained laboratory personnel. The R760 is designed for Precision. Servo drives ensure that all outcomes are completely repeatable and can be controlled by the Human machine interface (HMI). Module 1: Forming The forming module of the R760 blister machine can be used to either cold form aluminium blisters or thermo-form. Forming parameters can be controlled from the HMI. Force, Temperature and dwell time can be entered into a menu and chosen from the touch screen. The tooling is interchangeable and the same machine can very quickly be swap between products. When purchased on its own, the forming module can also be used to seal, perforate and punch. In this case the tooling is exchanged between process steps, the machine automatically recognizes the new tooling and production continues. Module 2: Filling, which can be used as a manual filling table or to automatically fill product. Modules 3,4,5: Sealing, Perforating, Punching. Sealing can be either standard sealing or frangible sealing. For both types of seal a module is required for each process step. Punching tooling can be simple tooling of highly accurate ground tooling. Module 6: Discharge Here the web ladder waste is re-wound and the finished product dis-charged. Printing and marking options can be installed at this station. The R760 uses the same tooling as its smaller brother the R550. this means that processes proved on the R550 can be run on the R760. Optional Foil printing systems for lid and base foils. Optional Water cooled tooling for heat sensitive products. Optional Isolator technology for containment of product or operator protection. 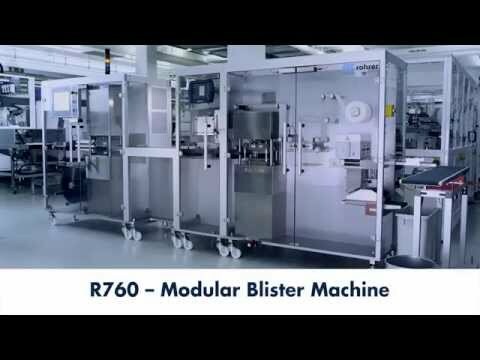 The new R760 Modular Development blister machine is organic. It grows with your product. The R760 can be upgraded from single station semi-automatic to fully automatic machine.